Heavenly blog! : No. 1477: The judicial system in Norway is spreading in all directions when Hairdresser Merete Hodne is called "Nazi hairdresser" and has never even made a "fly" fortress, and this is allowed, but not to call a real psychopath for psychopath, it is punishable! No. 1477: The judicial system in Norway is spreading in all directions when Hairdresser Merete Hodne is called "Nazi hairdresser" and has never even made a "fly" fortress, and this is allowed, but not to call a real psychopath for psychopath, it is punishable! The judicial system in Norway is spreading in all directions when Hairdresser Merete Hodne is called "Nazi hairdresser" and has never even made a "fly" fortress, and this is allowed, but not to call a real psychopath for psychopath, it is punishable! After meeting the court in three court cases, I begin to have a feeling that there is a big difference between people both in the public administration and in the legal system. Think, here is a simple hairdresser hanged out as a Nazi, it is not prohibited with Nazism in Norway. But hanging out someone like a Nazi is all right, it's bad. I have no faith that Merete Hodne is a Nazi, and call her that, then this makes it a criminal statement. The same thing that Jan Aage Torp did with defining me as an Anders Behring Brevik cloning. I have been hanged out as Anders Behring Breivik trailer, sympathizer and successor of Torodd Fuglesteg and Jan Aage Torp. It is obviously punishable. The lie of the lie is one thing, but what does the media do? They write that Merete Hodne is …………. What is this then? If it is criminal to call Jan Aage Torp for a false apostle, narcissist and leper. Then this must be super-criminal if there is to be equality for the law. Now I'm going to stop here, but I have to say I've got a great sympathy for Merete Hodne who has been convicted, lost lawsuits she should have won and been acquitted of. There was a lot of "wonder" about Malika Bayan's visit to Merete Hodne's hair salon. There were some signs that it was a conscious provocation. How deep did Bayan's religious beliefs steal? Not long after all the trouble she took off her hijab. That Hodne was convicted is really a shame! That I am convicted of having called Jan Aage Torp (pictured) for a false apostle, narcissist and leper is a spirit of greater shame. And that he himself goes free to call me Anders Behring Breivik follower, sympathizer and successor. It is the Løgnaslaget and Jan Aage Torp who have done something criminal and punishable here, not Merete Hodne and Jan Kåre Christensen. But then we have not included the snout addition and the snout factor! HatPastor-Jan Aage Torp which has a bigger and more pompous notion himself thaneven Anders Behring Breivik goes Oslo police good for, talk about standing onthugs page! 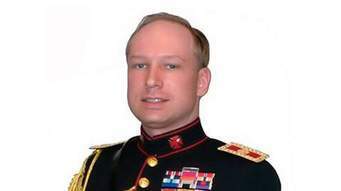 Picture of Anders Behring Breivik who considers himself a knight etc. But Jan Aage Torp is even more pompous, he is an "Apostle" with an "Apostle center." Mann's "stone crazy" in my estimation! Hat Pastor-Jan Aage Torp purports to be a Pastor (Shepherd) and an overseer, as God's word says not to be re-married. But a woman's husband. This would Torp not to follow, but is the (u) -skyldige party and feel when he can marry again, although his former wife is also now re-married. This is based on the word of God disqualification due to both salvation and Pastoral service. Should one then not be allowed to preach against this further? And if it does, then finds a just something else that's been preached. Vips, then it is a matter for the police. I have to ask myself again and again, we find ourselves in North Korea or Norway? Oslo police runs here thugs errands, and acting on the same side as Torp that is more pompous than even Anders Behring Breivik! The upcoming trial is for me easier and easier when I know for myself that this is not only is Christianity persecution, but it is becoming a form of madness that Hat Police in Oslo have done! They shall defend and vouch for a person who has a far larger, pompous and foolish picture of himself than even Anders Behring Breivik! Breivik saw himself as a knight, Torp sees himself as an Apostle ala Paul. Talk about our psychopath of rank. This is simply madness, madness to defend such a person! What police do we have here in Norway? Ala North Korea, it looks like ?! Bibeltro cabinet is often selective character. While others pay the price, it is quite ok. The Bible is a frequently used weapon to control other people. When someone is so brazen that they point out that the Emperor is completely naked, only to take them to court. I shall Torps accounts and wish to pay by 2 years in prison for his own iniquity! Torp said among others . : "I have no qualms with that he must serve." Imagine, here he is the culprit, and I will be zone and he has no qualms against. Talk about being a psychopath of rank! Torp is re-married as believers, that's why he hates me and the Heavenly blog. He went with a fictional review of the Oslo police and managed to get under. Then he went out that I would get two years in prison as punishment frame for this, so it was deserved. But deserved for whom? He himself of course, but the psychopath is a master distort everything. As here, as always. Torp is clearly a psychopath who is able to distort such and even upheld by the police that it is I who should be taken as holding forth God's word and speak. And it does not surprise me if the police also want me to pay court costs for the whole. The brazenness of and hate the police and Torp knows no limits or restrictions! It's good to be saved and to be both loved and give it back! It is sad to see how police and Torp hate, they can not possibly feel good with themselves. If the police had done their job, they had in this case actually done everything 100% different. They have not done a thing actually quite good here. At Torp hold on as he does, that he has done during all these years. And he will surely keep on with forward white he is not stopped! I always come Torp and police in the face, but nothing is good enough! It testifies against them, that I have set up forever and nothing has been good enough anyway, but so it is with the kind of people. I meet Torp in Mediation and offer him to go through all of what I had written. But he rejected this blank, it testifies again that we have with an "actor" to do. I've tried to change the words and expressions, such as the police asked me to do at first when we had a fairly "normal" contact, but it is not good enough either. They said they were going to do some of this matter, after meeting in Mediation, but then they would run case anyway, poor hateful people! Torp's own verbal words and expressions against me and others surpasses most. He has called everyone else except themselves with the worst words and terms. Torp called homosekuelle for scum and they should be removed from any position in society etc. about me, he has written and said this: "If you wanted a" desire opponent ", then Jan Kåre Christensen" perfected ". Moreover writes Torp that I am stalker, totally unintelligent, a Nolde "hat blogger", idiot, demon, desire lies, vile blogs, outcasts who lack the mind of Christ, ordinary judgment and social intelligence. "+ More! Hat Pastor Torp think he is the innocent party, therefore he can both remarry and do most, typical psychopath is this! If I am convicted, this will open the way for all kinds of people. They can only say that I'm so kind and good etc. smile from ear to ear as Hitler did before he revealed his true colors! How an act in such secrecy and dangerous country, not so one should work in a democracy like Norway and elsewhere in the Western world. Hat Pastor Jan Aage Torp is more pompous than even Anders Behring Breivik, ridiculous and dangerous that one is not allowed and should be allowed to debate, warn and opinion about such a person. It is klebling of religion and freedom of speech! This printer Torp on its homepage to Oslokirken that he is both Apostle and now he will have a Apostel center in his church etc. More pompous and obnoxious it may not be. Mann is next gal, he lives in adultery is an adulterer and live in sin. Is clearly a psychopath and a power man, and he will be Apostle with a Apostel center? Although Paul did not have a Apostel center and he was an apostle, no this is savagery. He is also called innocent and can remarry even though he has broken both his own family and many other people. If one can not warn against January Aage Torp, then it is free for all, even the Antichrist! This is essentially a struggle and freedom of religion and freedom of expression and to preach preach unhindered! Here is the theme divorce and remarriage. But next time it will surely be preaching warn against the gays and lesbians or anything else. Here one should be subject to interminable. And I could have written ten times as much about Torp. After I came in contact with him and have studied and tried to put me into who this is, and whatever else he has written and spoken. So this was like a barrel that was turned holes and all kinds emerged. And he is not really the only one, there abound of similar people within its most pentecostal / charismatic churches and movement similar types and preachers! It testify that Jesus said fit perfectly Torp and large parts of the Pentecostal / charismatic movement. Matt. 23. 25 Woe unto you, scribes and Pharisees, hypocrites! For ye make clean cup and the dish, but inside they are full of extortion and excess 26 Thou blind Pharisee cleanse first the cup and platter, that it also may become clean! 27 Woe unto you, scribes and Pharisees, hypocrites! For ye are like whitewashed tombs, which outwardly appear beautiful, but within are full of dead men's bones and all uncleanness 28 So you also outwardly appear righteous unto men, but within ye are full of hypocrisy and lawlessness. Woe to you, Jesus, everything will look so nice and great. But inside it is terrible! When Torp writes that I have mentioned him 100 times as is the bulk after he reviewed me. Then it was like squeezing a tube, and it came out all the works of the flesh, unclean spirits, and doctrines of devils + + much more! "The police have been deceived!" When the Hat Pastor Jan Aage Torp. Enjoyed little as Behring Breivik was a knight, is Hat Pastor Jan Aage Torp an Apostle, really they are both crooks! 2 Cor. 11. 13 For such are false apostles, deceitful workers, transforming themselves into the apostles of Christ. 14 And no wonder; for Satan himself masquerades as an angel of light; 15 Therefore it is no great thing if his ministers also masquerades as righteousness; But their end shall be according to their deeds.